Ok everyone, I didn't give anyone much time to change their links to my blog, but I did send everyone a personalized email with the new URL. However, there is a problem. I have noticed the "Google Friend Connect" has been discontinued as of March 1st, and I cannot add it to my blog. So, in order to be a faithful follower as usual, you'll have to subscribe to RSS, which I believe will show my blog posts in a Google reader. "We're sorry... This gadget is configured incorrectly. Webmaster hint: Please ensure that "Friend Connect Settings - Home URL" matches the URL of this site." I've spent almost 2 hours trying to figure this out. Because they've discontinued the Friend Connect, no matter how many times I try to connect to that website, it won't let me. It redirects me to Google Blogger help. Grrrr. It's so frustrating. If anyone is technological savvy and can help me find another way to show my followers, I'd love to hear from you! eek that sounds very complicated!! I too am experiencing this issue after changing my url (My "Followers" tab has disappeared and now reads: "We're sorry... This gadget is configured incorrectly. Webmaster hint: Please ensure that "Friend Connect Settings - Home URL" matches the URL of this site."). Since you stated that you found a way to correct this issue, may I ask what method you used to correct this issue? I cannot see the "Followers" tab on your page so are you now using a different gadget besides the "Followers" tab? I have researched a method to correct this for hours and have found nothing that works. 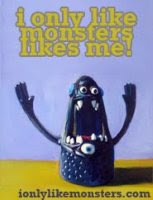 Thank you and love your plush monsters. Nope. Once I changed my URL of my blog, I couldn't get into Friend Connect, do you know why? Because it no longer exists. It may still exist on people's blogs, but I tried logging in and changing the info, but I couldn't. I never said in my blog that I found a way to correct it. And there is NO other way to show the followers on the blog. Sorry. How you fix it ??? Hi Afiqah, Google's friend connect somehow fixed itself. Don't know how.